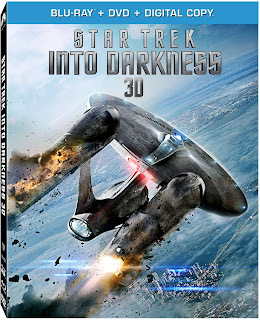 Last month when Paramount announced the extra features for the home video releases of Into Darkness I found myself surprised at how few they listed - Just seven featurettes, nothing else at all. Shrugging it off as information still to come, I left it at that. Then last week the digital download version of the film was released, including an audio commentary with the iTunes release. What a relief I thought, there are more extra features. How wrong I was. As The Digital Bits discovered when they got their review copy, that really is all there is. There are more extras out there, they've just been sprinkled around as retailer exclusives: So to get the full experience, you need to go to Best Buy and Target to get their exclusive versions which come with bonus discs (or the Sainsbury's exclusive copy in the UK), and then despite all the disc releases coming with digital copies anyway, you'll have to go and get the iTunes download as well if you want the audio commentary. Thanks a lot Paramount! I'm pretty sure you're not going to find many people crazy enough to buy the film three times to get everything, but you are rather certain to annoy the fans. And we're not just any fans, we're Trekkies, a passionate bunch, who support your Star Trek brand with unreasonable vigour! I think the retailer exclusives that offer alternative covers, or extra stuff, are cool - Amazon has the phaser, Walmart/Play the Hot Wheels USS Vengenace, Walmart in Canada the Klingon Mimobot - They offer something for the fans that want to seek out some extra things, but don't detract from the basic offering on the discs themselves. Unlike this mess with the extra features. Those of us who buy physical copies of films expect that investment to be rewarded with extra content, that you don't normally get from just downloading a title. What film doesn't have an audio commentary? That's a basic feature of home video releases! I'm sure I'm not the only one happy to pay a premium to get a deluxe edition of a film with a bunch of extra features I want to watch, but I'm not going to get it multiple times! This seems like a pretty obvious case of shooting themselves in the foot too, as this surely can't do anything but encourage illegal sharing of the illusive extra content. And whichever version you get, knowing this has happened, you know you've got an incomplete product. Since The Digital Bits posted this many other sites have picked it up; TrekMovie, TrekWeb, io9, and Blastr, for starters. I'm adding my voice here to what I hope is a chorus Paramount cannot ignore! This is no way to treat loyal fans who want to buy your product. We want to enjoy the film, and then find out all about how it was made, and the people who made it. Don't abuse that loyalty to your brand.